Like Aristo, Faber-Castell was a company famed for its slide-rules. With the appearance of hand-held electronic calculators in the early 1970s sales of slide-rules were hit hard. However, the first hand-held electronic calculators had the disadvantage of only providing the four simple arithmetic functions (+, -, x, ÷), whereas many slide rules provided more advanced functions. Faber-Castell saw an opportunity here and started to produce a combined electronic calculator and slide-rule which had the advantages of both. This was the Faber-Castell TR1 which was launched in 1974. Distinctive features: Combined electronic calculator and slide-rule manufactured in Germany by Faber-Castell, a company famous for its slide-rules. 4x button cells in slide-in pack, either expendable or rechargeable using a separate charger (TRL). 170 x 58 x 15 mm (6.7" x 2.3" x 0.6"). Introduced: 1974 (source: Faber-Castell website). This example has serial number 14030012, which indicates that it was manufactured in March 1974. The battery pack slides out of the calculator to replace expendable button cells, or for recharging in a separate charger if using rechargeable cells. The battery pack has been completely removed. The button cells can be seen inside. A slide rule is attached to the back of the calculator, which provides extra, advanced, functions beyond the simple functions of the electronic calculator. This photograph shows the second side of the slider which has extra functions. Note that, due to having the slide-rule on the back, the screws holding the casing together screw in from the front so the screw heads show a little inelegantly on the front. 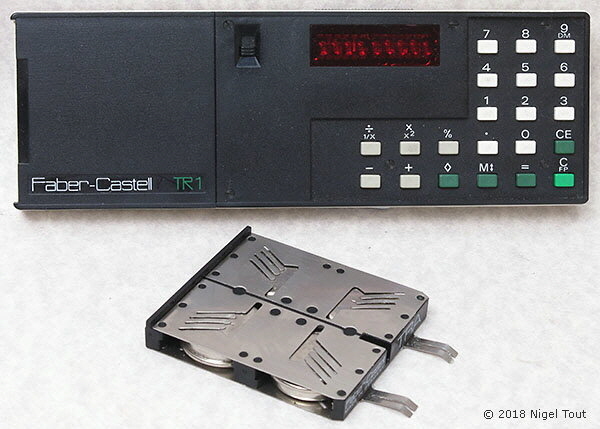 Faber-Castell produced three models of combined electronic calculator and slide-rule; in order of increasing functionality, the TR1, TR2, and TR3 (where the electronic calculator has scientific functions). They also produced three models of similar size electronic calculators without the slide rule; the Faber-Castell TR1N & TRX and the JohannFaber 76 (see photograph below). 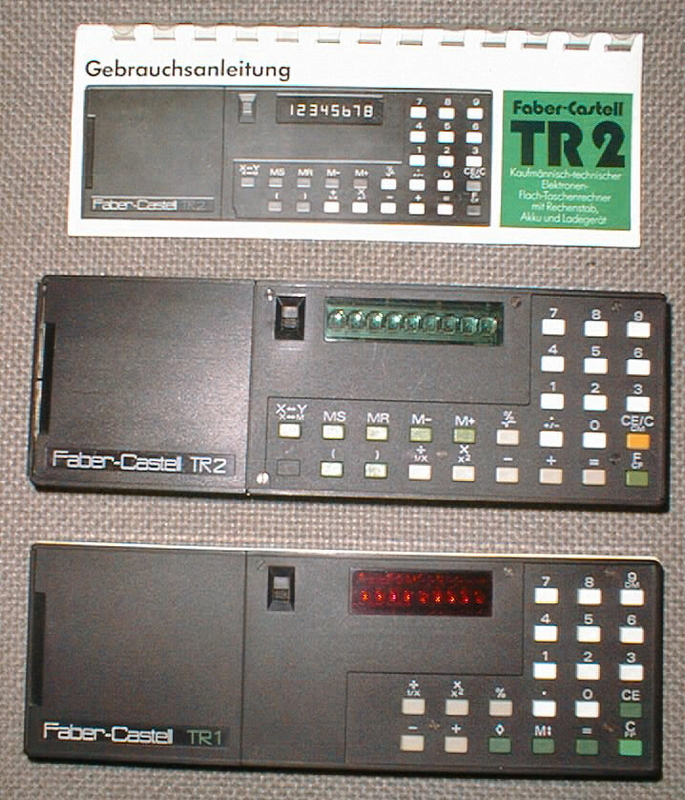 Faber-Castell TR2 and TR1. The TR2 appears to have a green LED display but this may be the colour of the circuit board surrounding the display seen through the clear window since photographs of the TR2 with the display illuminated show red LEDs. 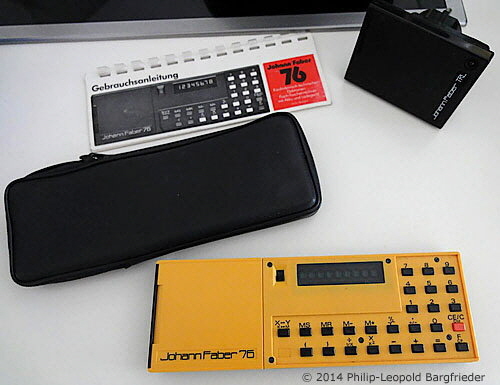 JohannFaber 76 with TRL charging unit (top right), operating instructions and carrying case. The date of the introduction of the TR1 in 1974 was unfortunate since it was after the first scientific hand-held electronic calculators had arrived, heralded by the Hewlett-Packard HP-35, which started to provide the same functionality as the slide-rule. Competition in this area was soon very fierce, Faber-Castell could not compete and departed the calculator market in 1975 to concentrate on its core business of graphic arts supplies. Faber-Castell: "A brief history of the slide rules". Von Jezierski, Dieter, "The Faber-Castell Taschenrechner (TR): A Pocket Calculator Combined with a Slide Rule", Journal of the Oughtred Society, Vol. 10, No. 2, Fall 2001, p12-p14. The video https://www.youtube.com/watch?v=cnH044Emqc8 shows a Faber-Castell TR2 being disassembled (something which is not recommended).